Get to grips with Epic's revamped MOBA. 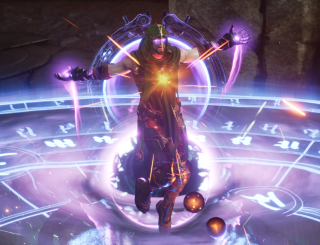 There’s a lot to like about Paragon, Epic Games’ action-oriented MOBA, especially after the overhaul it received in its recent Monolith Update. The patch notes are lengthy but the short version is that Paragon got better. Obtuse mechanics were straightened out, cooldowns were shortened, movement was hastened and we even got a new, smaller map. And boy, do I feel silly. I only recently came to terms with pre-Monolith Paragon. Now I’m going to have make all kinds of mistakes to learn the ins and outs of this completely rebuilt version. But before I start embarrassing myself in the jungle, I thought I’d share a few tried-and-true tricks of the trade. And while there’s plenty more to learn, these simple pointers will always be helpful. Even after slimming down considerably, Paragon’s map has lots of blind spots. That means lots of places for enemies to hide, set up a surprise attack and ruin your day. To avoid getting caught unaware, you’ll want to place wards. You can grab potions and strike tokens at the start if you like, but you are just asking to die if you don’t buy a ward within your first six card points. Grab one early and plop it down in a good spot—along the map’s central stream or your go-to escape route, for instance. Coordinate with your teammates to build as broad a ward network as possible, and once you do, check your minimap like it’s your rear-view mirror. You should also destroy enemy wards and rearrange your own as the match progresses. As is the case in any MOBA, communication is key in Paragon. Aside from a chat box, and luckily for console players, the game offers a robust system of quick-access notifications which you can use to keep your team in the know. Nothing is too trivial. If you need help attacking or defending a tower, ask for it. If you’re returning to base to buy upgrades, say so during your teleport animation. If there are suddenly several enemies in your lane, alert your team early so they can be ready to defend that tower or join the fight. If there are suddenly no enemies in your lane, you’d best call that out lest another teammate find themselves surrounded. And perhaps most importantly, don’t forget to thank your support for saving you. Epic could have used artifacts or gems or any number of MacGuffins for Paragon’s item system, but instead they chose cards. So it’s only fitting to apply some CCG wisdom to deck building: you need some cheap stuff because the early game is everything. You can tailor your deck however you like, but always be sure to include two or three pieces of three-cost equipment filled with one-cost upgrades. This allows you to advance faster by rushing to the completion bonuses on cards. Look at Windcarver Blade, for example. Fill it with three minor strike cards and for just six card points you can grab 36 power thanks to its fully upgraded bonus. If you put in a three-cost major strike right off the bat, you’d only get 24 power out of the deal. That makes a huge difference in the early stages of the game, and you won’t be at a disadvantage later since you can sell cards at any time for a full refund. You can’t repurchase cards, however, so try to sell only when you’re ready to complete another, more powerful card. You’ll earn 60 card points throughout an optimal Paragon match, though heavy losses or poor jungling may leave you shortchanged. Still, you should always plan for the best by fleshing out an end-game deck that costs a total of 60 points. You should also distribute those points between six different cards. That means selling off your potions and other trinkets once they lose their effectiveness (usually around level 10) to make room for more impactful passive and active cards. Personally, I like to use two 12-cost cards (e.g. a three-cost equipment loaded with three-cost upgrades) and four nine-cost cards, but mix and match as you see fit. Building with 60 points in mind guarantees you’re at your strongest in the climactic team fights, and using all your card slots nets you maximum completion bonuses. If you have any leftover slots, add alternative upgrades to your cards. You never know when you’re going to get a hankering for some extra health or lifesteal. Paragon is currently sitting pretty at 25 heroes, and you should sample all of them as soon as possible. Aside from choosing your favorites and deciding who to spend your limited deck slots on, this will also give you a chance to learn the abilities and animations you should watch out for, like Countess’ blink, Greystone’s ultimate and pretty much everything Kallari does. The less you know, the more likely you are to wander into a bad situation. Besides, you get a batch of cards each time you hit level three with a hero, so you can also build up your card collection while you learn the roster. That’s just good game design. Take advantage of it. It’s important to claim and stick to a role in Paragon, and indeed all MOBAs, but don’t be afraid to roam around. If you’re heading back to left lane but the enemy is pushing right, maybe stop by to defend before you return to your lane. While you’re at it, use your time away to replace some wards or help your jungler clear minion camps. If the planets are aligned, you could even call for a raid on the highly coveted Orb Prime. There are plenty of good reasons other than team fights to leave your lane for a few minutes, and the game’s new map design ensures it won’t fall to pieces in the few minutes you’re away. And what should you do when you have something different or daring in mind? Call it out!